Terrapin, a name commonly applied to several species of land tortoises, but in the United States generally limited to the few freshwater species of the family emydoidoe, extensively used as food. They have a depressed head, and the neck can be wholly retracted within the shell; eyes large, and the beak somewhat like that of a bird of prey; they are good swimmers, and out of the water move with more quickness than the land tortoises; their food consists of small reptiles, fish, and other aquatic animals, though in captivity they eat vegetables readily. - The yellow-bellied terrapin (trachemys scabra, Ag. ; emys serrata, Baud.) is 12 in. long, 7½ in. wide, and about 11 in. high; the shell is rounded, very convex, notched in front, deeply serrated behind, wrinkled longitudinally, and rough all over. The color is blackish brown with yellow lines and marks more or less radiating; sternum yellowish, notched behind; snout short and pointed; upper jaw with a very slight notch; eyes large, with golden iris having a broad black stripe extending horizontally through it; fingers five, each with a short strong nail, and toes five, fully webbed, four only having nails; tail short, thick, and pointed; head and limbs black, varied with yellow lines, a broad transverse band of the latter across the neck behind the eyes. 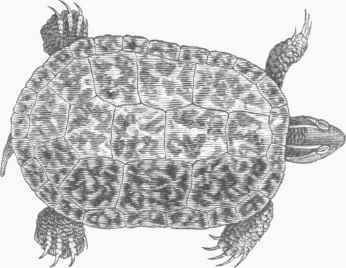 This species lives in stagnant ponds and pools, and is fond of basking in the sun on the margins and on stones and stumps, whence it can readily plunge into the water if disturbed; it is found from Virginia to Georgia, south of the latter being replaced by the Florida and north of the former by the red-bellied terrapin; it is abundant about Charleston, S. C, where it is seen in great numbers in the markets. - The red-bellied terrapin, or potter (ptchemys rugosa, Ag. ; E. rubriventris, Le Conte), is 11 in. long, 7 in. wide, and about 5 in. high; the shell is entire in front, widest and notched behind; upper jaw deeply notched, and the lower serrated with three teeth in front; shell, head, neck, and limbs dusky brown, with blotches, spots, and lines of red; sternum dusky red. It lives in running waters, preferring rocky bottom; it is found between the Delaware river and Chesapeake bay, and is abundant about Trenton, N. J.; its flesh is less esteemed than that of the preceding and following species. - The Florida terrapin (P. concinna, Ag. ; E. Flori-dana, Harlan) is the largest of the species, being 15 in. long, 10 in. wide, and 7¼ in. high; the shell is entire, compressed on the sides; the jaws without teeth, the lower somewhat serrated; the shell, neck, head, and limbs brownish, with numerous yellow lines and bands; sternum pale yellow, the marginal plates with a black spot having a yellow centre; throat ashy, striped with yellow. It is extensively distributed through the southern states, in lakes and rivers, from North Carolina as far as western Louisiana, and up the Mississippi valley to Arkansas; it is very common in E. Florida, especially in the St. John's river; its flesh is delicious. - The chicken terrapin (deirochelys reticulata, Ag. ; E. reticulata, Schweig.) is 9½ in. long and 5½ in. wide; the shell is oval, entire, longitudinally rough; upper jaw slightly notched, lower entire with a hook in front; neck very long; above, head, neck, and limbs dark brown, with numerous yellow lines communicating so as to form a network, whence the specific name; lower parts yellow, with black spots on some of the marginal plates. Its habits are the same as in the other species, the long neck giving it in the water somewhat the appearance of a snake, as it swims with this part and the head alone visible above the surface. It is found from North Carolina and Georgia to Louisiana, not far from the sea coast; it is often brought to market, and is the most esteemed of the terrapins for food. - The saltwater terrapin (malacoclemmys palustris, Ag. ; E. terrapin, Holbr.) is 7½ in. long and 3 in. high; the shell is nearly entire, slightly notched posteriorly; the head is very large; jaws strong and cutting, the upper slightly notched and the lower hooked; eyes small with a gray iris; neck short and thick. The color is dusky olive-green, with darker concentric lines; sternum generally yellowish with concentric dusky lines; side of the head, neck, and limbs brownish white with innumerable black dots; the males are the smaller, and have deeper striae. It lives in salt water and in salt marshes, where it hibernates; it is very shy, a rapid swimmer, and a quick runner on land; it is found from Rhode Island to Florida, along the gulf of Mexico, in South America, and perhaps in the West Indies; it is abundant about Charleston, S. C.; the flesh is excellent, and in the middle states most esteemed during hibernation.